How To Roast Perfect Pumpkin Seeds – Easy, Crunchy, Addictive! The first time I roasted pumpkin seeds, I burned the crap out of them. It was heart-breaking, especially since I wasn’t convinced it was even worth the effort in the first place. All that seed cleaning and pumpkin de-stringing – I didn’t even get to enjoy the fruits of my labour. Hrmph. Here is the part that no one told me about: The inner seeds cook much faster than the outer shell. I kept peeking in the oven and everything looked fine on the outside. Little did I know, the inner seeds were burnt to smithereens. Well, thank goodness I didn’t give up after that first miserable attempt! My life just wouldn’t be complete without roasted pumpkin seeds. I’m happy to say, the second batch didn’t just work, it blew my mind! The cup of seeds I roasted did not last long between the two of us. Every pass by the kitchen was an excuse to grab a crispy handful off the pan. Today, I’m sharing my secrets for a fantastic batch of roasted pumpkin seeds. If you’ve ever doubted they were worth the effort or had so-so results, I beg you to try this one last time. Only I know it won’t be the last time, but the start of a life-long obsession. Watch out pumpkins, we’re coming for ya! 1. Clean the seeds. The annoying-but-necessary task is that you have to meticulously clean the seeds until there are no signs of pumpkin guts. The best way to do this (that I have discovered from your comments!) is to plunk the seeds + guts into a big bowl of water and use your hands to break it apart. The seeds will float to the top of the water! They clean much faster this way. Note: Some of you say that sugar pumpkin seeds yield much crispier seeds than carving pumpkins. I used sugar pumpkin seeds and mine were certainly super crispy! 2. Boil for 10 minutes in salt water. Using Elise’s method for inspiration, I added the pumpkin seeds to a medium-sized pot of water along with 1 tsp salt. Bring it to a boil and reduce the heat to simmer, uncovered, for about 10 minutes over low-medium heat. 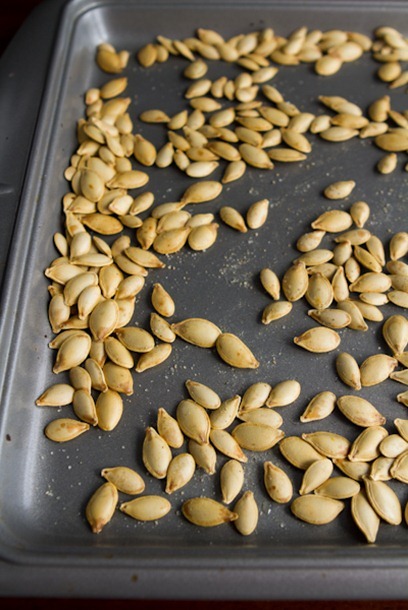 Apparently, this method helps make the pumpkin seeds easier to digest and produces a crispy outer shell during roasting. If you are short on time, you can totally skip this step! They will still turn out lovely. 3. Drain the seeds in a colander and dry lightly with a paper towel or tea towel. The seeds will stick to the towel, but just rub them off with your fingers. Don’t worry, they don’t have to be bone dry – just a light pat down. 4. Spread seeds onto a baking sheet and drizzle with extra virgin olive oil (I only needed to use about 1/2-1 tsp). Massage oil into seeds and add a generous sprinkle of Herbamare (or fine grain sea salt will do). Try to spread out the seeds as thin as possible with minor overlapping. 5. Roast seeds at 325F for 10 minutes. Remove from oven and stir. Roast for another 8-10 minutes (if your oven temp is wonky, this bake time could vary a lot!). During the last 5 minutes of roasting, remove a few seeds and crack open to make sure the inner seeds are not burning (you don’t want the inner seed brown). Cool a couple and pop them into your mouth to test. They are ready when the shell is super crispy and easy to bite through. The inner seed should have only a hint of golden tinge to it. They should not be brown. 6. EAT! Remove from oven, add a bit more Herbamare, and dig in! Ah, so good, so good! There is no need to remove the outer shell; it’s quite possibly the best part. I had no idea I was going to love freshly roasted pumpkin seeds so much. I love how crispy the outer shell is and how fun it is to crunch. They taste a bit like popcorn, but they are much crunchier, filling, and of course packed with nutrition. Yes, pumpkin seeds are super healthy for you! They are packed with iron, magnesium, fibre, zinc, potassium, healthy fats, protein, and tryptophan (which can boost your mood and help you sleep). 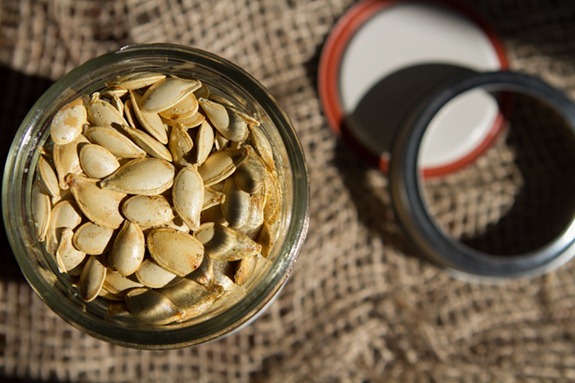 Vegans & vegetarians have been using pumpkin seeds for years as a natural source of iron. I think it’s just about my favourite way to get iron, next to Iron Woman Gingerbread Smoothies, of course. Be sure to pair it with Vitamin C to absorb the most iron you can. I promise you’ll never throw the seeds out again. I want to buy pumpkins just to be able to roast another batch of seeds. And of course, make homemade pumpkin puree. I’m already looking forward to making some different flavour combos – maybe garlic powder, cayenne, rosemary, brown sugar or cinnamon, nutmeg, ground cloves, etc would both be nice to try out? I can’t wait to experiment…many ideas are a-swirlin’ in my…stomach. and about 30 more pumpkin recipes! 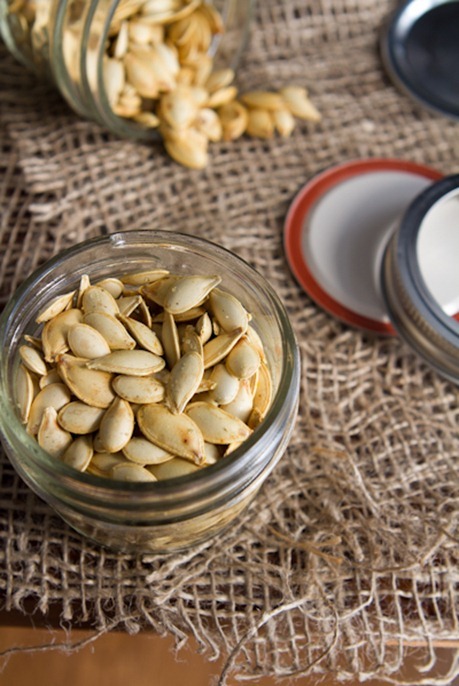 What spices would YOU put on your roasted pumpkin seeds? To email, text, or print the directions, click here. I make these all winter long! Never heard that about boiling it… will have to try it. They are also really good roasted with coconut oil, cinnamon, and a bit of cardamom. Or savory with a curry powder! coconut oil – great idea! Add a bit of cinnamon even better! I soak the seeds for a while and the pumpkin gunk separates if you set the water level hughg enough…pumkin seeds float! Straining through paper towel after colander helps too. I wear a pair of gloves to make cleanig seeds easier and keeps my hands from itching. Soaking seeds for about an hour first makes cleaning a snap. I rub seeds against each other. I’ve attempted seeds before and failed. No one would eat them. This receipe is awesome. Thanks! Why toss the gloves? Environmentally really bad. They can be washed and reused! Besides the sunk environmental cost of having manufactured the gloves, transporting them, and selling them, what “environmentally really bad” consequences are you imagining to be associated with placing used latex gloves in the trash? will sit in the landfill forever…. This is a very good point since I only own yellow and red spoons and would be very interested to see how the spoon color affects the scooping of the pumpkin seeds. Whatever you do, DO NOT use a blue spoon. After 250 stitches and a 3 week stay in the hospital, plus several months rehabilitation, I can say that this is a very bad idea. Thanks Pete! you made laugh!!! I found this also that the seeds are buoyant and the pumpkin guts are not. Good observation. Cut the top off the pumpkin. Cut the rest into quarters, put the quarters in a clean sink full of water and the process will be a breeze because the seeds float. Just scrape them out and scoop up the floating seeds in a colander. will soaking the seeds affect the roasting of the pumpkin seeds. I am an eager at home cooker and am looking for the best way to roast pumpkin seeds. I like the curry powder idea! They came out wonderful! Thank you. I am roasting pumpkin seeds for German Seedy bread- Dreikernebrot- right now!. Turns out the pumpkin seeds i bought at the store are coming from China and I worry they have heavy metals or something worse-though they look at taste ok.
love this new found dark German seedy breads- also calls for seseme and sunflower seeds, dk rye, and whole wheat flours. No need to rinse. Pick out what you can and spread out onto sheet or counter and let dry overnight. They taste BETTER if you don’t bother cleaning them up too much. I get most of the stuff off by squeezing them out of the pulp and whatever little bits there are I leave on. I totally agree. I love little bits to cling to the seeds. Really ups the flavor! I agree with you! Seems like a real shame to take away the natural flavor ingredients. I get off by squeezing mine too! It’s a BURST of flavor! Hey Deb, I’ve been trying out this no rinse method and WOW…really, really delicious. Looks like I’ll have to update this post soon. Thanks for sharing everyone! Please do update post, or create a new one. I don’t rinse or boil seed with great results but havn’t found a similar method online (except in comment sections). Totally agree, no rinse and no boil is the way to go. I add nothing but a bit of salt as they dry. The German bread sounds great! The title literally means three seed bread. :) Can you send me the recipe please? Lucky for me, I have my own little pumpkin patch growing like crazy in my garden right now! The pumpkins aren’t quite ready for picking, but now I can’t wait until they are! I personally will love adding spicy Herbamare to my seeds, but my husband isn’t a huge salt fan, so I’m thinking I might make him a spicy batch seasoned with cumin and chili powder! I haven’t done this since I was a kid!! I’m thinking I need to channel my inner child and get my hands dirty! Oh yeah, I’ll have you know I bought 2 sugar pumpkins yesterday thanks to you and I’m going to roast them and make something yummy! Thanks!! thanks so much!! helped me a lot!! Why be so complicated? When I roast my seeds, I leave the pumpkin guts on the seeds, adds a bit of pumpkin flavour to them! I toss them with a bit of soy sauce (or use tamari), and slow roast them in the oven, checking often. They are so yummy! Really? Interesting – didn’t think that would work! Do they take longer to roast? I usually leave some guts on as well, and have never boiled them. They take about the same time, as I recall (it’s been a year, so hard to say). I usually roast at 350. I just tried the method you mentioned above last night – (didn’t boil the seeds in salt and left some guts on). It worked, but I have to say the seeds had less flavour (even when sprinkling on salt) and they didn’t get as crunchy compared to the boiling method. I would definitely recommend giving the boiling method a shot! I’ve also heard you can add spices when boiling and it infuses the seeds. I’ll be trying that next. Thanks for trying the non-boil, leave some guts on method, Angela! We appreciate you testing and reporting back. I’ll definitely try them YOUR way. I have never boiled my pumpkin seeds either. They taste much better with the pumpkin bits baked on and it’s much less work. I’m also concerned that boiling them will drain them of the nutrients they provide. Dana, how do you know they taste better if you have never boiled the? She said they taste better with the pumpkin bits left on. Not that they taste better not having been boiled. I agree with Natalie. My mother and I used to use the same methowhen I was a kid and I always took them to school. Now that I’m grown and have a newborn daughter, I am keeping this tradition/recipe going. However, rather than school I take them to work and more often hunting with me. It doesn’t matter how big of a bag I take, they never last long enough. Ok last year I gutted pumpkins first and then spent hours rinsing the guts off. This year I pulled seeds out first. The seeds come right out with a little squeeze and the majority of guts stayed in place. It took all of five minutes to rinse off! Thanks for the boil advise. I make three batches using extra fine popcorn salt, then creole mix and finally garlic powder with Lawrey’s. I’d like a chipotle lime flavor to my seeds, or maybe something sweet like cinnamon & agave? I will seriously carve an absolutely horrible design into a pumpkin (4 year olds can carve better than me) just to get to the pumpkin seeds. They are like little pieces of delicious healthy crack! It’s great to know that the best of cooks even burn their seeds ;) My very first recipe on the blog was roasted squash seeds, one of my favorite things about Fall. I still do it every now and again. My favorite seasoning is probably herbamare. Can’t (ever) get enough of the stuff! Glad to see the Herbamare love – it will make anything taste good. Easy way to clean the seeds: soak them in water for an hour, then rinse them in a pasta strainer. The holes should be large enough to let the pumpkin out and small enough to keep the seeds in. Massage the seeds while rinsing and pick out the larger clumps of pumpkin, and they will be perfectly clean in less then 5 minutes. I believe that when you soak them, they float and you can just (mostly) skim them off the top! I just dumped them into a large mesh strainer and as I rinsed them I rubbed them against the mesh. They were clean in a matter of minutes! I make a version with rosemary, olive oil, garlic, salt and cayenne- people raved about them at my halloween party last year! I’ll have to try the salt water boil trick this time when I make them! I’ve only ever tried roasting pumpkin seeds once and they turned out very meh. So I’ve never done it again and now I need to try your method and try again! I usually rock a salt or cinnamon flavour but maybe nutritional yeast is in order this year! Great tutorial, I’d never heard of boiling them first. Thank you! Those combos sound perfect! LOVE the idea of using nooch too. I’m having a Halloween party and was having a hard time finding healthy treats for everyone (I have cookies, cupcakes, cakepops, etc). This will help so much! Who doesn’t love roasted pumpkin seeds? The sweet and spicy combinations sound delicious! I always make many flavors each year…love them. My friend does like 10 pumpkins and brings me the seeds. I always leave a little gunk,as I call it, on the seeds taste yummy after it’s baked. I always make salt and pepper, garlic and salt, buffalo wing sauce(these take longer to roast,but so good), and once I even did tomatoes(small cherry tomatoes cut in half) with basil and olive oil. They are all so good. And I use the same method for chick peas that I roast when I have no seeds. I am trying to remember the specifics, but I experimented roasting so many different kinds of winter squash seeds last year. Some were awful – the “thicker” ones, but I can’t remember which were good and which were bad… I think kabocha was a bust. You are right, Lauren. The type of squash can make a big difference. Probably the age and maturity as well. I have had great results from sugar pumpkins, calabaza, and delicata. Carving pumpkins came out ok. Butternut pretty tough. Thanks, Angela, for the great tutorial. Thanks to all the contributors for the great suggestions. I can’t take the credit but my husband last year made a sweet batch with a little brown sugar and cinnamon. And a spicy with garlic, salt and cayenne. They were delicious! Also we weren’t too thorough on cleaning for the sweet batch and I agree with someone else who said this, but the pumpkin goo that was left on helped to make it sweet! They were still crunchy too! Thanks for this! Last time I had homemade pumpkin seeds, I was in second grade, after a field trip to the pumpkin patch, and they were super chewy and hard to swallow (literally!). I haven’t had a taste for them since, but I’m definitely going to try this when I get my pumpkin for Halloween! Do you know if seeds from sugar pumpkins and carving pumpkins differ in how they’re roasted? That’s a great question – I was wondering the same. Maybe someone else knows? I could eat handfuls of pumpkin seeds. I have never done it this way. I want to see if there is a significant difference to my lazy but simple way! I just rinse, pat, and bake. I have a feeling your version is going to taste better though. ;) I will let you know! Thanks for the post Ang! One thing I love is dividing the seeds and make a sweet version and a savory version! if you put the seeds in a big bowl of water then swish them around with your hands and let them sit for a while, most of the pumpkin falls to the bottom and the seeds come up to the top! almost completely clean by then. I roasted the pumpkin seeds I had last fall but I must have done something incorrectly. Do you eat the outside shell also? I guess I didn’t realize there was an outside and inside shell. I tried eating the outside shell and I couldn’t chew them. They were tough and stuck in my throat. I ended up throwing them all away. Someone commented saying the sugar pumpkins yield crispier seeds. Was it a carving one? I’m not sure what it was. I thought it was pie, but maybe not. I always forget about it but yes so good! Yum yum! My spice of choice would probably be smoked paprika. I recently found some at a specialty store and have been putting it on everything! A few years ago my friend made some with seasoning salt. One of the BEST batches I’ve ever had! Oh Angela. How I love you and your wonderful brain. These look AMAZING!! Perhaps curry powder and garam masala for curried pumpkin seeds? Yes that would be amazing too! When my family does our annual pumkin carving, I’m totally making these. I always tell myself that I should, but throw out the seeds because I really didn’t know the best way to go about roasting them. Now I do….Thanks!! Any thoughts about trying with raw Pumpkin seeds from a store? I think our whole foods sells them raw in bulk. Probably nowhere near as good as ones fresh out of the pumpkin, but maybe a good compromise for when pumpkins aren’t in season? I love making pumpkin seeds! I do a paprika& cayenne w/ a sprinkle of sugar for that hot / sweet taste. Soooo good!!! I make chai flavored ones sometimes – I take a roobis chai tea bag and put the contents in the blender – grind until it’s small bits – and then sprinkle over seeds!! A little salt can be added or a little sugar! The sugar caramelizes a bit on them – so tasty! 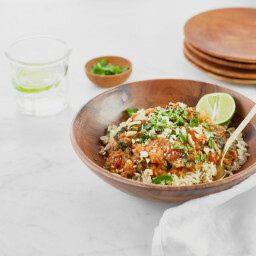 I also love curried ones too! Thanks for the salt-water boil tip. I need all the help I can get in the digestion department. I always try to do different toppings, but always come back to cumin and cinnamon with a dash of cayenne! Cumin all the way, baby! And I must say, throwing a batch of raw seeds into the garden one or two times can actually be just as satisfying; I have surprise pumpkin plants this year because I was too lazy to roast the seeds a few times! Score! Mmm I love pumpkin seeds on salads!! I also love these fall food how-to’s lately! :) Last fall I made a sweet-n-salty batch of pumpkin seeds by whisking some stevia into egg whites, brushing that over the pumpkin seeds, then sprinkling them with sea salt. In fact, I’m craving some now! What a happy coincidence! We just roasted a spaghetti squash and “roasted” the seeds in a pan because I was lazy and time crunched. They turned out better than any I had made previously, but I’m interested in your methodology here! I like the sound of really crispy shells! Oh, and my best advice for cleaning seeds is to actually put them into a regular bowl of water and the guts float to the top. I just scoop them out and pick the ones that are attached to seeds. I also love roasting butternut squash seeds. I’ve never boiled them first though. I love pumpkin seeds. I will not have a chance to try to prepare them this season. I don’t think they have punkins here in Afghanistan. I am going to have to check on that. This is tooo exciting! I can’t wait until we get pumpkins in our local supermarket – then I am going to be up to my elbows in delicious pumpkin :) Thanks Angela! Can these be dehydrated instead of roasted? If so, how? Good question – Im sure they can be! I would try looking online as Im sure others have tried it out before. Goodluck! I just read the link to the ironwoman gingerbread smoothie. I need to get some blackstrap molasses in my life! I’ve been looking for it but can’t find any locally so I might just have to order some. Is there a particular brand that you like? Thanks for all the great info on getting proper nutrients with a vegan diet! I will have to try that out, great idea! Please tell me how to eat these! Do you eat the outer shell/husk or do you have to bite that part off and just eat the inner seed? Thank you! You can eat the outer shell…I love it. Boiling the water helps with digestion a bit too. Some ppl do remove the outer shell, but its personal preference. 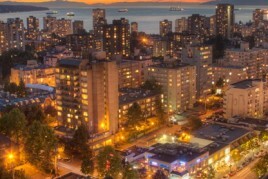 Angela–super pumped when I found your beautiful website last nite! 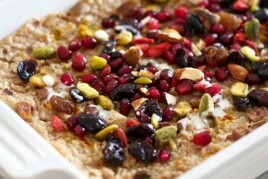 Then I got this yummy recipe in my inbox today! I also don’t pull the pumpkin-y stuff off of them. Too much work for me. However, I will say yours look way prettier than mine, and I like how you put them in a nice jar–made me think it would be a great gift. Also, I had NO clue these were packed with iron–and I’m always borderline anemic, so I’m thinking all the more reason to make these. Thanks so much!!! I have always loved roasted pumpkin seeds – they were always my mom’s favorite thing in the fall, and I remember cleaning many a pumpkin out just for this purpose. We never boiled the seeds, though…. just roasted them, stirring every once and a while, being careful not to burn them… and have never had any problems. I think I burnt a batch once, but it was due to oven discrepencies. Anyway, I think my favorite is just with a little sea salt, but I’ve also enjoyed a pinch of cayenne for kick, or some cumin to warm things up a bit. It’s hard to go wrong, really! I luv roasted pumpkin seeds. Every time I see a seed I want to roast it! Even if it’s mid dinner party prep. This weekend I roasted spagetti squash seeds, putting the entire meal behind by 40 minutes. It was worth every complaining hungry belly that came through the kitchen. I found them sweeter and crispier. I wonder if it’s cause I didn’t take the time to rinse them. I know I will be doing it every time now! I have to admit it, it is fall when we are roasting pumpkin seeds! Try doing a chili pepper and cumin rendition – I love spicy pumpkin seeds! I love roasted pumpkin seeds! I’ve never heard the boiling in water part first though. I’m definitely going to have to try that out! Love that – I’ll have to try this out! I LOVE roasted pumpkin seeds! I will have to try your method – I have only cleaned them up, sprayed with olive oil and a little salt and toasted them. MMMM – I have also used a mix of salt, cinnamon and chili powder – sooooo good! I have also only used carving seeds – and they are great. I am going shopping today though – sugar pumpkins are on my list so I can make your pumpkin butter and now seeds :). Thank you! aw that’s a bummer…I know some ppl who don’t like the seeds at all, so maybe they just aren’t your thing! Did you use a sugar pumpkin? I’ve heard seeds can vary by the type of squash. Oh I’m glad that I found this post because I have been craving roasted pumpkin seeds that have a sweet but spicy flavor and now I can do that. I’m thinking maybe cinnamon and cayenne pepper with coconut oil. Still new at this pumpkin thing! I was thinking of making and adding these to my morning home-made muesli, but I’m hesitant because of the salt used to boil them. Does the taste stay? If yes, is there a way to avoid using salt in this recipe? Thanks a lot Angela!! I am going to attempt my first batch of Endurance Crackers tomorrow! I picked up some coconut flower, do you have any suggestions on how to use it in baking? In one of your pictures, the seeds are stored in a jar. How long do they keep in a jar? Long enough to mail as a gift to a friend? I’m sorry I’m not sure since our stash didnt last longer than a weekend! I would guess they’d keep for a while…you could also store the jar in the fridge too. Can you freeze pumpkin seeds to enjoy throughout the year? Thanks for the tip on the inside. I tried kabacha squash seeds since they were huge & similar to pumpkin. Will try your way on my remaining three squashes. 1st Q: Do the insides taste salty as well as the outside? Yes I would say its about 1 cup to 1 tsp. I tried a batch without boiling and the batch I didnt boil (just baked normally) didnt have as much flavour. I really think the boil trick works wonders! Just wanted to add another random comment to this thread–I just learned today that you can roast honeydew seeds too! In pretty much the same way. Yes I tried that last week and they were so good! He was so excited to try them and he says they taste ‘just like pop corn”! Lucky for me he doesn’t remember my nasty previous attempts. Thanks for posting! Roasted pumpkin seeds over the weekend and my husband and I loved them!! They were even more delicious with some cayenne pepper ;). Thanks for the recipe! They are SO good. I had to go to Whole Foods to find the herb salt, but it was worth it. With Squash seeds, I found that putting them in water & massaging out the seeds works great. Hope that works with my pumpkins today. I also soaked overnight in water with Salt & found them to be too salty for me, but less than if I buy David’s pumpkin seeds. I think your boiling method is just a speed version, but I think the soaking in some fashion does help. So, I don’t do any salt to mine. I toss them with Virgin Coconut Oil & roast them, then at the last 5 min or so, I toss in some unsweetened Coconut & sliced almonds. I have some raw Honey this year, so I’m going to add just a dab with the oil & get a bit of sweetness. Yum, thanks for the recipe. I just made a batch using my CSA’s butternut squash. Left some of the guts on and they came off during boiling. After all the recipes you find in the net with “healthy” labels.. its gets really hard to weed through the ones worth trying– Yours definitely belong in that category. 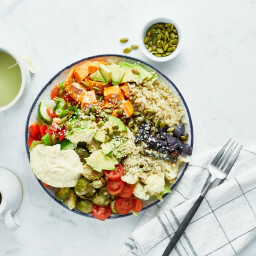 So far, all the recipes I`ve tried from Oh She Glows have turned out fantastic– That is saying alot,because even though I eat vegetarian all the dairy substitutes work just as well! I roasted the seeds without boiling them and definitely noticed the difference in the “crunch factor” I added Himalayan salt that is a bit more coarse and turned out really nice. Thank you very much for taking the time to post all this recipes. I have made pumpkin seeds for over 50 years and have just cleaned them then roasted them. the taste of the home made kind. Hopefully I get some more this year, if not I will probably have to buy some. I grew one last year but some critter got inside the pumpkin and chewed every bit of the “meat” and seeds.. If I wanna do them sweet with cinnamon and Brown sugar do I still use olive oil too?? Being smack in the middle of pumpkin and squash season I’ve started hoarding squash like no one’s business. A quick (ish) way to clean the seeds is to simply leave them out on a paper towel for a few days to dry and the pulp easily comes off when you rub the seeds in between your fingers. I came across this recipe a while back and procrastinated making it until last week. After they finished baking I put them in a jar in my pantry and (regretfully) forgot about them until today when I took them out to top my lunch salad. While the rest of my lunch heated up I popped a couple in my mouth….and then a few more…well they didn’t make it to the salad that’s for sure! I ended up putting the half empty jar back in the pantry to snack on later (read: 5 minutes later). I’m ashamed to admit I had no desire to share them! They are unbelievably delicious, crispy and and salty. I am NEVER throwing out my squash seeds after trying this recipe. Thank you Angela, I used to think the best part of a squash was the flesh, but now I think its the seeds! I have a sandwich bag of pumpkin seeds and was thinking about doing a taste test. I’m a nanny so I have a little bit of time during nap to do this. I could do the guts/bake method and the boil/bake method to see which i like better :) I think boiling them adds a step you really don’t need. and I think people are roasting them at too high of a temp…isn’t it 250-275 for an hour? I’m probably wrong. I tried these with carving pumpkin seeds. The outer shell is too chewy. The seed is really good, but a lot of work to eat. I guess I need to find the sugar pumpkins or just go an buy some seeds. Thanks for the info. Quick and easy pumpkin seed cleaning – fill the bowl of seeds with water; with your hands scoop up some seeds and any orange hitchhikers; spread a handful on a dry papertowel; and pat the top with another papertowel; lift up the bottom paper towel and the seeds easily fall off or easily get knocked off and the orange goop stays behind! A little time consuming but you get clean seeds every time. Sugar, cumin, cinnamon, ginger, pinch of cayenne. Best sweet and savory seeds. Seriously. In the past, my seeds always burned or were undercooked, but the boiling in salt water first worked great! I seasoned mine with some garlic powder, chilli powder, cumin and sea salt. Used some cooking spray when they were done to get a little more salt to stick. Having a carving contest at work, going to get all the seeds and bring them home and cook them tonight. Will boiling the seeds kill the nutrients like it does with most foods? I just carved 3 pumpkins with my kids and I am really looking forward to roasting the seeds. Thank you all for your great tips, my mouth is watering! Pumpkin seeds float in water, pumpkin guts are heavy to neutral, just dump the guts with the seeds an all in a big bowl of water and mix around with your hands. The seeds will float to the top, then just skim them off with your hands. I’ve always boiled the pumpkin seeds first, before I roast them….. but I never put oil on them. Actually, there is really no need for the oil if you want to save calories. I am sure they taste great both ways. I carved pumpkins last night but didn’t have to roast the seeds so we put them in a large ziploc bag and put them in fridge over night…this morning I took them out and brought them to room temp…then rinsed them and the pumpkin slime and guts rinsed right out…took about 2 min….currently trying your recipe..over the years mine are never crunchy enough so I’m giving yours a shot! Thanks for the info…I’m sure the family will love em! when i boiled them they turned grey, and boiling them made them chewy and yucky. I roasted them twice as long and they were sitll chewy. I didn’t like them at all. I will go back to my old way. I baked my seeds but dont think I baked them long enough ( still a bit soft to chew) can I bake them again?? i make them with salt and pepper:D!!! After removing the big pieces of pumpkin I gave the seeds a quick rinse in white vinegar followed by a couple rinses in water. It was fast and the seeds got very clean with little effort. I don’t think the vinegar affected the roasting at all. I just tried these! One batch with salt and pepper and one with cinnamon and brown sugar. They taste great, but a little tough on the inside, the outside is supercrispy though. Do you maybe have any ideas how to get them crispier on the inside? I already put a little extra time in the oven.. I found mine were like that too…Im not sure how to fix that unless maybe you dehydrated them? That would probably make them the most crisp of all. Thank you for the quick reply :). I don’t have a dehydrator, but the temperature on my oven can be put very low, so maybe I’ll have to try that next time! Cook them at 250 for 40-60 mind depending on the size of the seeds. Keep in mind though. Gas ovens create moisture during the combustion process. So if you have one you may want to take a ball of tin foil to prop the door of the oven open to let the moisture escape. 1-I will try to boil them…..I have made these now for 10 years. 2- I am curious about experimenting with different type of spices, BUT, I am not sure what to try, differently…..any ideas?? 3-I after I pat them down, I put seeds in a container and put ALOT of butter on them and sprinkle them with some pepper, TINY bit of garlic powder…not really much salt because your salt is already buttered. 4-mix and spread out on cookie sheet. Slow roast about 325 degrees…turning maybe 1 or 2 times. Might add little more butter on pan and spread around. 5- you will hear them. “POP” in your oven. I just cook them slowly and they will brown…cook maybe 20-30 min….more or less….just look. When cleaning the pumpkin seeds. You should just put them in a large cool bowl of water. Then just rub the punkin residuals off of them. The effects should be easy to filter out with your fingers. Also, There is no real need to boil them, as long as you give them a “Brine” bath in cool water, and then bake them at 250 degrees for 40 – 50 mins. Taste to make sure that you have cooked them enough. I have done this for a long time with a few alterations. 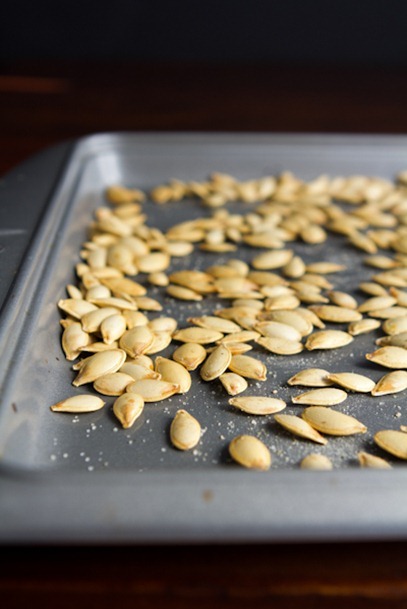 Cleaning the pumpkin seeds – drop them gunk and all into warm heavily salted water. Let sit an hour or so and the stuff comes right off. Toss them into fresh water with a 1/2 cup of salt. Let sit a few hours or overnight. I stuck a couple handfuls of seeds and guts (small amount of guts) in a salad spinner that had some water in it and had the kids spin it. It didn’t completely clean the but it did remove a good amount. the seeds floated and the guts sank. Next time, try using sesame oil instead of olive oil…it makes them taste buttery and super yummy. I did this by mistake one day because I grabbed the wrong oil out of my cupboard and it was the best mistake I ever made!!!!! The garlic is very tasty! Be careful though the garlic burns very quickly. I ruined a whole batch with garlic at 375*. To rinse pumpkin seeds,dump thme in a pot of water and swish them around 90 % of the guts will fall off,the seeds wil float to the top,then put in a coleander with bigger holes and swish again,that loosend any left over guts,then you just have to pull off a few strays,then follow through with what you do which i’m going to try this weekend,your is the best way so far..Thank you!!!! If you still want to clean your pumpkin seeds,I put about about 2 cups in a gallon milk jug, filled about 80 perent full with hot water put on the lid and shook vigorously. Strain through a sieve that will easily catch the pumkin seeds , but will let something the size of a pea pass. after i patted dry i put back in the colander and added just a drop or two of the olive oil and swished them around then onto the sheet that i had used a paper towel to put the oil on and wipe down as to not get too much..WALA! I roast just about every variety of squash seed. Who says you have to limit yourself to just pumpkin! I just used your boiling method on a batch of spaghetti squash seeds. (After a dinner last night of spaghetti squash topped with homemade tomato pepper sauce). I also roast my butternut squash seeds too. They all turn out crispy and crunchy. I love this time of year! Another good recipe – have you ever made dinner in your pumpkin? Clean out a medium sugar pie pumpkin(about 5 -7 lbs.) and fill with cooked chicken sausage, zucchini, 1 cup rice, 1 can diced tomatoes with juice, and a drizzle of olive oil. Place the lid back on top (securely so rice can cook), place on a baking tray, and put the whole thing in the oven. 350 degrees for about 1 1/2 hrs. or until rice is cooked. So good! When you scoop it out you dig into the sides and get pumpkin too. My favorite use of a pumpkin! Pumpkin guts + water + Stand Mixer on low for a minute or so = clean seeds. I was looking through the comments (forgive me if I missed it) and was wondering… instead of cleaning the seeds and THEN boiling them, could you just do the “clean” and “boil” step in one? The easiest way to clean pumpkin seeds is to drop them in a sink of cold water as soon as you pull them out of the pumpkin. Let them soak while carving and you’ll be surprised at how easily the pumpkin guts separate. Just squeeze the seeds off the guts. Use a strainer to round them up while they’re floating on top of the water. Good luck, I’m going to try the boiling method right now. I used smoked paprika, cumin, ancho chili powder and salt. Just made these. I’ve never done the boiling step before, and the hulls do seem a little easier to eat. Thanks for sharing. 1. Remove all of the big chunks of pumpkin string. 2. Fill your blender with water almost to the top, and put in the seeds. Pulse gently. 3. The seeds stay at the surface of the water. Remove them replace the water, and repeat if needed. Old Bay seasoning for me! To de-string my pumpkin or squash seeds, I brush them around the bottom of the colander with my vegetable scrub brush. Of course, I pick out the bigger clumps first. The strings get caught in the bristles, so after a minute of scrubbing, the seeds are perfectly clean. I agree about lime zest, chili powder and cayenne as the best spices. I’m going to try some tamari tonight. Plus some grated garlic and salt, of course. I found the easiest way to separate the seeds!! Put them in a large pot and fill with water. The seeds float and the guts do not!! You just pick them off the top of the water and then dig through the guts to separate the rest. Super easy! Every one of you have such great ideas that I would like to try. I just put a part of my batch this year in my jar of Dill Pickle juice I was saving. I will just soak them in there overnight and probably roast them tomorrow afternoon. Excited to try them. I find that a baking scraper is helpful to separate the strings from the seeds. Simply splay them out on a cutting board and use the scraper to “cut” the strings. Omg thank you so much ive been looking forever for how to make these seeds im going to try them out right now all i have to do is clean them and ill be ready to start ! Rather than first spreading the pumpkin seeds on a cookie sheet, then tossing with olive oil, I put the seeds in a plastic bag, add the olive oil, toss to coat, then spread on cookie sheet. Covers all the seeds evenly and easily. To Clean …. or Not To Clean …..
Just did a side-by-side taste test; 1/2 guts-n-all (some with significant ‘guts’ !) with light garlic powder mixed in and spread with fork on Pammed sheet. 1/2 cleaned, boiled then simmered in tbsp salt to 2c water for 1/2 seeds 10 mins, pat dry, mixed garlic, Mrs Dash, little parmesean in melted butter, spread on sheet. 325 10 min, stir then another 10. Both were great. Guts-n-all definitely had a slightly sweeter and more pumpkin flavor…and crispy. Clean and boiled seeds were also crispy and seemed ‘lighter’ and a little easier to chew. Anxious to try some of the wonderful suggestions found here. Thanks for sharing your results, Jennie! Thank you so much for the tips – I never considered boiling the seeds first – good idea. The first time my friend made roasted pumpkin seeds, I was immediately obsessed. WAY better than popcorn. I can’t wait for the day after Halloween! 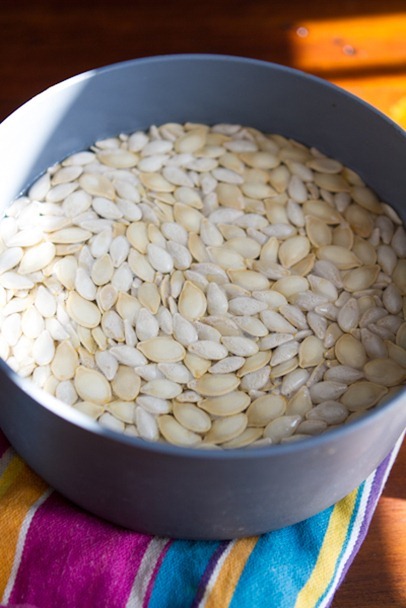 Just tried your method for roasting pumpkin seeds and it came out wonderful! oven, I sprinkled them with sea salt and organic sugar. Making more tomorrow! Definitely the best results! Yum! Thank you. Never boiled seeds before but it did make them crunchy. As mentioned, they reminded me of popcorn. So good. My husband and I really like them with a little sea salt and the receipe recommended amount of olive oil. Would like to try a spicier version next. Time. Hiya – I just slow roasted a huge Butternut Squash and a small Pie Pumpkin. The aroma was glorious! Soups surely to follow. I tried roasting the seeds using the boiling method suggested. They’re OK but I find them quite woody. Now, I’m an old grannie and can surely use all the fibre I can get but that texture akin to wood chips is a bit much! Were my squashes overripe do you think? Love all the suggestions for flavour combos. I usually spend my winters in the Algarve, Portugal. They have the most incredible array of squashes & pumpkins all winter long so I know that I’ll be doing more seed roasting over there. The squash seeds seem to be as good and flavourful as the pumpkin seeds, by the way, even though they’re smaller. My first batch was not edible. Taste was good, but was left with a mouth full of grit. I had already started without boiling before coming to this site; will have to try it out. The seeds were nowhere near as plump, either, so it may have been the type of pumpkin I had. A small minority of the seeds didn’t have an inside at all; I threw those out before roasting. EASY CKEANING toss vigorously with spaghetti scoop, fill sink with water, toss in all the stuff and run your hands through it n the seeds float to the top. Use a slotted spoon to skim the seeds off the top. To clean the seeds I used strainer and put the faucet on high, every once in a while I would run my hand through the seeds. I sprinkle with seasoned salt. Taste amazing. DO NOT BOIL THE SEEDS! Mine came out chewy and too FOREVER to cook. Just rinse salt and roast at 325! My mom would soak the seeds in a bowl of cold water in the fridge overnight. The seeds would float while much of the guts would separate and sink to the bottom of the bowl. After soaking, she’d rub what was left of the guts off with her fingers while rinsing the seeds in a colander and then dry, spice and toast as usual. Thanks for the great directions! It was easier for me to search online than to look through my cookbooks & I found yours right away. The seeds are great & it was simple. Love them! I have only made good pumpkin seeds once, I always end up burning them! Tonight I tried your method of boiling first and they turned out so good! I wanted garlic and salt, but had no garlic powder, so I boiled them with minced garlic then tossed them in extra virgin olive oil that I had blended with a few garlic cloves. I like tossing them with olive oil in a bowl before roasting so they are evenly coated. I had to roast them for about an extra 5 minutes, then sprinkled with sea salt. Yum! Not sure if I will have enough to share at work tomorrow! I can’t wait to try other flavors. I want to make a batch of smoked paprika and a batch with tajir (a mexican chili/ lime seasoning). I am so excited to try these, I am actually simmering the shells as I type. :) My husband has actually requested that I make a few different flavors so I am trying Cinnamon, Garlic and finally just plain sea salt. :) Thanks for this great recipe. I just roasted my first ever round of pumpkin seeds using your directions. I spiced mine with cayenne pepper, truffle salt, and green chili sugar. (Olive oil was my lipid of choice.) Absolutely crack-tastic. I live at about 6,000 ft above sea level, and for other high altituders- I had to bake for an extra eight minutes to get to crispy perfection, so be aware that your bake time may increase. I bought an organic pumpkin and the amount of guts was considerably less than regular carving pumpkins. The seeds were MUCH easier to clean and the amount of gunk I had to sift through was very minimal. Separating Pumpkin Seeds from Pulp: The last few times I roasted seeds, I squeezed the pulp to roughly separate the seeds from most of the pulp. Then I put the seeds and remaining pulp in a large bowl (in the sink) and filled the bowl with water, while spinning and agitating the seeds with my hands. The pulp sinks and the seeds float. I use a hand held strainer to skim the clean seeds off the top of the water. amazing ideas, we tried the boiling method, it worked great. Makes a great after school snack / activity THANK YOU!!!! Interesting method of cooking them, I must try it. My absolute favorite pumpkin seed herb is rosemary. Delicious! This recipe does NOT work! My seeds are chewy. The seeds did not cook all the way through with such a low temperature. Fantastic. I’ve only ever had other peoples and they obviously don’t boil ’em. The difference in the shell is outstanding. Must now get more seeds to roast, yummmm! Today, was the very first time I tried to make roasted pumpkin seeds. Back in my homecountry, you can buy them at the store, but they aren’t really popular (yet). I recently bought a pack of pumpkin seeds at the grocery store here and tried them at home. Berk, way too salty (forgot to read the label). I did not want to throw them away, so i washed them thoroughly. And I really liked the “natural” flavour. A few days later, I made a pumpkin soup. Actually I had 3 halfs of a squash (dont know which kind though) and a small jack o lantern pumpkin. I just used all of the seeds and tried to follow your recipe. What can I say? Wow? Thank you so much? It is just delicious. I went easy on the salt (I dont like anything too salty) and it actually tastes much different than the seeds I bought at the store (the shell were pretty chewy and hard to eat), but still, it is soo good. and crunchy. the shells are easy to eat. it tastes like pop-corn actually. thanks. from now on, i will never throw out pumpkin seeds again. ever. also, i did not found it too hard to seperate flesh and seeds. i kinda squeezed them out and then put the seeds in a sieve under running water and washed and turned them. I am boiling my pumpkin seeds as I am reading all the comments. I am using the Seminole Pumpkin which I grew in my garden. This is the second year I’ve grown them, it is a tan rather than bright orange variety, with sweet orange flesh. This year’s crop was fantastic and I am giving pumpkins away for gifts. This pumpkin is also a fabulous food crop and can last for months in storage. Pumpkin seeds are beneficial for men especially, they are a prostate food. This has been known for a long time in Europe, where they also make an oil from the pumpkins. Thank you so much for this! I agree with salt water boil concept. I found the easiest way to separate the seeds was to NOT scoop out the strings first. I used my fingers to “pull” the seeds off while the stringy part stayed attached to the pumpkin flesh. Then, scoop out the empty strings and use pumpkin for delicious things like cookies and soup. I had alderwood smoked sea salt and OHMYGOODNESS they were delicious. The olive oil tip was really helpful for this. I just found your site and I will be following it now for sure! Just roasted my first batch ever! The one I tried part way through was chewy though? Tasted good though! So I just did your recipe. Mine are very crunchy yet chewy and it cannot get it to chew up and end up spitting it out. Did I do something wrong or maybe I just do not like them? Hardly any are brown at all; did I not cook long enough? Thanks so much! Hi! Just tried your recipe and absolutely loved it! I added a healthy dash of tabasco sauce to the seeds while they were boiling and used seasoned salt instead of just plain table salt. I also experimented with roasting the seeds in a sauce pan. After boiling in some lightly salted water, I melted half a cup of sugar in a pan and stirred in four cups of seeds. They became sugar glazed and when they were browned and crisp I set aside to cool! Amazing! I also sprinkled some red pepper on a sugared batch and they became salty, sweet and a tad bit spicy! Best ever! Turned out great, thank you !!! If you submerge the seeds and pulp (I do in smaller portions) in water and mix up like a washing machine motion with your hands the seeds will float to the top. Then, you can scoop them with a strainer. I place them all in a bowl, then do with rest of my pulp. I just discovered this and it saves so much time and mess. Then repeat with the full bowl of mostly clean seed and you should get all of it. Sooo much better! To clean the seeds easier, why don’t you boil them instead of washing them off in a strainer? when you boill them with the residue on the seeds the residue will come off and you saved a step. Thanks for the info, carving my jack o lantern and am going to roast the seeds. Also going to try and make something from some of the pulp. Did you know pumpkin seeds are also high in selenium which is is beneficial for warding off cancer? We bring back Austrian Pumpkin Seed oil from Germany. Easier way to get your seeds…..pull them out of the flesh of the pumpkin before you scoop it out. It took only a few minutes to do it and minimal cleaning after I got them all out! It was super easy! I just wanted to say how great this recipe was. This is the first time I ever roasted my own pumpkin seeds and I have to say they were 100 times more delicious then what you would buy in a store. Thanks again for posting this and helping my make my first time roasting pumpkin seeds a success! I grew up eating roasted pumpkin seeds. I have always seasoned mine with season salt just like my grandmother did when I was a child. Hi there. I just de-gutted a pumpkin and the way I cleaned the seeds is by putting all the guts in my cleaned sink and just kind of man-handling the guts and pinching off the seeds. The seeds float. The guts seem to sink for the most part. Then I put the seeds into a colander (like for spaghetti) and I rinsed them. I then hand-picked out the very little remaining guts. The whole process took me maybe a half hour. Thank you so so much for sharing!! Ours turned out amazing and it was my first time! I haven’t boiled mine before but I will try it. I soak mine in water and salt over night. Then strain it works so well. this is so freaking easy to do. even for a 13 year old, like myself. The way i clean the seeds ( the same way i learned to clean coffee beans) discard all the little traces of pumpkin and rinse the seeds in a container a couple of times and then put them in a strainer. Spread the seeds on a tray covered with paper towels and let them dry for a couple hours. Remove the paper towels and put the tray with the seeds in the oven, but dont turn it on, the warm temperature will help the seeds dry more. I actually left the seeds there for 4 days because I forgot to check them before, you will see a kind of plastic film on the seeds, all you have to do is put them on a strainer ( is better if you work outdoors) and squeeze the seeds, the thin film will become loose easily, keep squezing, shaking the strainer and blowing the scraps away, and you will have perfectly clean seeds. I was very leery about the boiling of the seeds. Never heard of it . But OMG what a difference! They are nice and light and crunchy. I made savory , rolling them in a little olive oil and sprinkled with salt and pepper. Next will be sweet with cardamom and cinnamon. Yeah! I followed this recipe tonight with coconut oil and they are still slimy an hour and a half later! Ugh! Not sure if it is the coconut oil or just too many seeds so they aren’t a single layer. 1) I found the easiest way to get the seeds off the pulp is to do it by grabbing a handful and rubbing and rinsing under running water. The seeds slide right off! The pulp is in your hand just throw away . 2) after boiling I rinse them again running them around in a strainer, it .takes another layer of sticky off. Then I wadded up a couple of paper towels and spun around in there and it comes out with no seeds stuck on the paper ! They ended up chewy. Disappointed. Your recipe and instructions were terrific and the pumpkins seeds turned out perfect! Thank you so much! I took a cue from “Produce Pete” and his method of harvesting seeds from pomegranates–once you remove most of the pumpkin, fill a large bowl with water and the seeds will float and the pumpkin will sink!, use a slotted spoon to retrieve your seeds!! I used your recipe on acorn squash seeds and they were perfect! I love pumpkin seeds! This was a great tutorial but I want to add cinnamon. At what step would I do that? 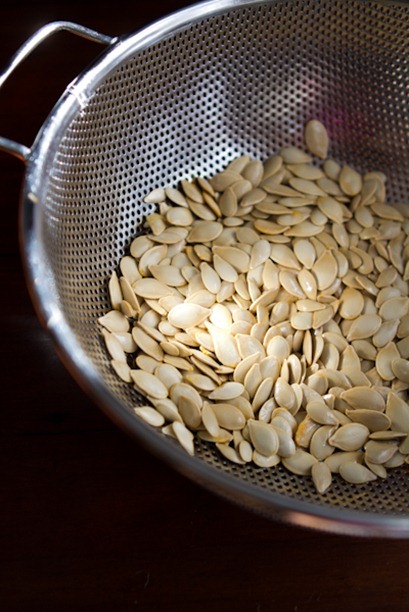 Here’s a fast way to clean pumpkin seeds: Put the seeds in the colander FIRST, then turn the water on. Take guts off of seeds as you rinse them. The guts come off easily and effortlessly. Easier way to clean seeds–put water in the bowl with the pumpkin guts. The seeds float to the top, so you can grab them with your hands or a slotted spoon. I KNOW HOW TO GET THE PULP OFF THE SEEDS QUICKLY! Just put all the seeds in a big pot full of water. Then massage the seeds. The pulp is slightly heavier than water so it will just sink to the bottom while the seeds just float. I made a delicious batch of pumpkin seeds just last night. The best way I have ever found for easy removal of seeds from the pumpkin is I wash the pumpkin while whole and put it on a cookie sheet and bake it whole until soft when pierced with a knife. Cut it in half and cool for a few minutes. The seeds have naturally seperated from the pumpkin. I give them a little rinse then in a small saucepan melt equal parts of butter and coconut oil a little salt and hot pepper sauce to taste. Cook seeds in the mixture for a few minutes then pour out onto parchment lined cookie sheet and bake for about 45min at 275-300 degrees. So delicious! I found a good way to remove the seeds without much of the gunky stuff. It was by accident. I was trying to find something to scoop out the seeds without getting my hands all gooy and sticky. I tried everything from my hands (yucky!) to a big spoon, but still had a lot of pulp. I finally decided to try a 1/3 measuring cup, and yipee it works pretty good, if you scrape the side of the pumpkin. I got more seeds in the cup and less of the pulp. The seeds that I couldn’t get out with the cup I used my fingers. Try it and hope it works for you. My colander has wider slats instead of holes, wide enough to let the strings go through but not the seeds. After I get most of the bulk off, I turn the cold water up on high, and use the sprayer to hose the seeds down real hard. It blows off almost ALL but a couple of stubborn strings. :D Easy and pretty fast! Just read this trick on facebook today and it worked great! Take all the seeds, pulp and all and soak it all for about 45 mins. Stir occasionally – the seeds fall right off. I’ve found the best way to clean the seeds is that when you go to remove them from the pumpkin, put your hand inside and comb the inside with your fingers. This will loosen all the seeds up then you can just dump them right out and scope out the rest. Then simple remove all the gooey stuff and discard. Then place the seeds in a colander and just keep rinsing until there are no more remains on the seeds. Thank you sooo much, I have been looking for days and was unable to find anything, unless I download stuff on my computer that I didn’t want. I also loved reading everyone’s comments. Now I’m afraid if they are as great as everyone says, I will have to go buy more pumpkins, I hate to waste, so I’ll be looking at your site to see what to do with the pumpkins themselves. To clean super easy: remove seeds first from pumpkin, do not just scoop out with the guts. It is easier to get just seeds with the guts still intact. Place seeds in double boiler, it has bigger holes than a colander so works better. Spray seeds with hot water with a spray nozzle. Seeds tumble around and get nice and clean! Pick out any strands that didn’t make it through the holes, spray one more time, and you’re done. I am a teacher of special needs students and today we will roast the pumpkin seeds, which I have never done before. Thanks to your recipe and tips, it looks as if we can do it. We will also be making pumpkin bread, pie, cookies, rolls, and whatever we have left over to do! Wish us luck!! LOVE this technique! Its the only one that works!! Thanks for sharing – I’ll link from my blog! I had the seeds in a colander and ran hot hot water over them (as hot as it comes from the tap). I put on my dishwashing gloves (the yellow rubber kind with the diamond-print texture on the palms– this is key). I found that if I then used my gloved hands to swish the seeds around in the running hot water, then strained them with my fingers (just small handfuls at a time), the remaining pulp would separate from the seeds and stick to my gloves. Worked like a charm! OMG these were gorgeous thanks you legend! Secret to washing the seeds is washing them immediately after removing them from the pumpkin. If they dry a bit with the pumpkin string, it makes the task muck more time consuming. I have found if you use a wire mesh strainer the remaining flesh will just push through the wire mesh leaving your seeds very clean. just followed this recipe…..finally a recipe that works. I did bake 10 minutes, stirred and baked an additional 4 minutes. they turned out great!! First time I really enjoyed home made pumpkin seeds, thank you! I can tell you how to clean the pumpkin seeds. You have to do it as you gut the pumpkin and there is a methodical way to do it. If you take the vein tha has the cluster of seeds on it, garb the seeds about half way down. Squeeze the seed like you’re trying to “squit” it back towards the palm of your hand. Your palm of your hand should have mostly clean seeds in it! As I gut a pumpkin I place the seeds in a separate bowl. The bowl needs to be pretty good size. After you’re finished gutting all your pumpkins, take bowl to sink and run the hottest water you can get out of the faucet into the bowl. I let them soak while I clean up the pumpkin guts and finish scraping the insides of the pumpkins so they are ready to carve. Any guts that were left on the seeds have sunk to the bottom of the bowl! From here I get a large slotted spoon and take seeds out and put them into a colander. The seeds always feel slimey and that’s normal. Rinse e seeds one last time while in the colander. I boil the seeds but not to make them crispier but so the salt soaks into the seeds so I don’t have to oil them as some recipes say to. After they are boiled and placed on the sheet pan I sprinkle salt on them. At this point they do NOT need oil for the salt to stay on the seeds. That is if you think you’ll need more after boiling them n salt! I add a little more because I like the saltier taste but you have to be careful. Feel free to email me if I haven’t explained it well enough! Boiling these ruined my seeds! I usually make pretty good seeds in all kinds of flavours but nothing tastes good on these. Yuck. I can’t believe so many people had such good results. I agree with those that say to not over rinse and leave some guts on. More natural means more nutrients and better taste in my opinion. well i just burnt my second batch of squash seeds, this time acorn flavor but i now know i should have taken them out when they first started popping instead of going “huh? ?” and watching the miniature explosion going off in my oven.. also the temperature was too high and the seeds were probably a bit too dry. But for getting the gunk off, I actually use scissors and cut the seeds off all the stringy bits and then rinse them and then to dry, i put them in in a baking pan, sit it on top of the stove while i cook the squash and they dry in no time..maybe too dry that way! onwards on my squash journey.. Wow!! My first time as a mom baking pumpkin seeds. Your receipt was spot on. We loved them as a family. Thank you!! Tried your way tonight! Boiled them in salt water. I drained them through a colander and poured them into a shallow bowl. I patted them dry then mixed a teaspoon of salt and a teaspoon of sugar together and poured it over the damp pumpkin seeds. I spread them out over a cookie sheet then baked them for 15 minutes at 350 degrees. Very tasty! Thanks! So I made the carving pumpkins andbaked the seeds off for another 10 minutes to crisp them up. They didn’t brown inside. The outer shell is just less chewy and they are great. To get the seeds clean more easily, put all of the goop in a large bowl or sink full of water. The seeds float, making it much easier to get them free. I then put them in a second bowl of water and mixed them around to get the little scraps off. Then I used a small strainer to skim the seeds off of the top of the water. Much easier than picking the seeds out of the gllop! If your put seeds into big bowl and fill with water, the seeds will float to the top. Skim them off with very little pumpkin to remove. I find that when trying to de-string the seeds if you have your seeds in a large enough basin (I wash my sink and then fill it up with water to de-string) I just use a whisk and whisk really hard and fast and the whisk tends to tangle the string to itself and snap the seeds free. Yummy! My first time ever roasting pumpkin seeds! I followed your recipe, except I used regular salt, and they turned out wonderful!! Thanks so much!! I made my first batch last night :) They came out great! After boiling them, I tossed them in 2 Tbsp. Olive oil, 1 teaspoon Worcestershire sauce, 1 teaspoon garlic powder and salt to taste. I had 4 pumpkins worth of seeds, so my batch was large. I baked at 325, stirring and tossing every 10-15 minutes. It took about 45 minutes but they were so good! Tonight I put the second batch of seeds to boil, and forgot them for about 1.5 hours! Does anyone know what will happen to the seeds? Did I ruin them? Use a kitchen aid salad spinner to remove pumpkin guts….works like a charm. Great tips for roasting the pumpkin seeds. I boiled the seeds, but did not use oil when I baked them. They turned out great. Thank you so much for your Pumpkin Seed Recipe. You asked about cleaning the seeds. Try placing them in a deep pot (I use a spaghetti Pot), filling it 1/2 – 3/4 full. Using your hands rub the seeds together like your washing your hands. Let them sit for a minute. The Pumpkin guts will sink and you can skim the lighter seed from the top. I like the salt and boiling method as well. These were ok…I did some with the oil and some without. Definitely liked the ones without better. Tried some with seasoned salt, some with garlic salt & parsley and some with a greek seasoning…preferred the garlic salt & parsley. Thanks for sharing! I think the seeds float to the top when covered in water, making it easier to separate them from the guts. I use old bay seasoning! A little spicy kick! i musta had a shiddy pumpkin. or maybe my extra virgin olive oil wasn’t really a virgin. followed recipe to a tee , but they just did not get crisp. could have been chewing a shoelace.reached for a pizza , instead. I only do this with my carved halloween pumpkin goop but I separate the seeds the night of halloween and let them soak overnight. This doesn’t make step 1 faster but it’s less fussy than rinsing multiple times and you’re sleeping anyway. This is a great healthy snack and rumour has it that pumpkin seeds are a great weight control food because of the magnesium it contains which boosts your adiponectin levels. This boosts your metabolism without making you feel hungry. Great recipe Angela, thanks! About cleaning the seeds… When I looked up how to roast them many years ago it said don’t worry about getting them really clean. So while I clean out the pumpkin I separate them from the goop but don’t clean them super clean. It adds flavor & I do them this way all the time. I surprised myself. These came out quite tasty on my first try. I don’t keep any sort of seasoned salt on hand, so I used fine sea salt. Nice to have something to do with what would otherwise be tossed. I found the easiest way to clean the seeds is to put them in a huge bowl of water along with all of the attached pumpkin parts. The seeds will float to the top and most of the pumpkin will sink. Then you can strain out the seeds a bit easier. I had to do it a couple of times. The bigger the bowl – with more room for the pumpkin to fall to the bottom – the easier it is. I soak my seeds in salt water over night in the fridge. The pulp pulls off the seeds and I then head to the boiling stage using fresh water. I’ve been roasting pumpkin seeds for many many years. Although I never boiled them, I have never had a problem with them being crispy. I used to use just Olive oil and Salt. Since then,, I have been blending my own seasonings and have some wonderful combinations. I replaced the Olive Oil with Sesame Seed Oil. For seasoning, I use Chef or the Future’s Original Cajun, Floribbean or SouthWestern blends. All I can say is that the preparation takes longer that the consumption, Cheers! To get only seeds out. The first thing I do is use a whisk. A few twirls around separates all the seeds from the “guts”. Then they just fall out of the pumpkin, ready to rinse. I have made pumpkin seeds many years at Halloween, and by far this recipe produced the best I have ever made and eaten. This was also confirmed by many family members and friends. Thanks so much!! When cleaning the pumpkin, I put the the seeds, stingy stuff and all, into a bowl of water and soak for a bit. The seeds will seperate from the stringy stuff. No more picking them clean! Just remove the bulk of pumpkin from the water, drain and rinse! We let the boys choose from different popcorn flavorings. Buffalo, kettle corn, nacho, etc. Very easy to do! Someone may already have suggested it, but I just put the pumpkin guts and seeds directly from pumpkin into a big bowl and run water over it to cover generously. After it sits for a little while, the seeds float to the top and can be skimmed off. (Some of the pulp floats too, but is easily pushed aside.) A quick rinse and the seeds are ready to go! I made these with the hands on help of my 14 month old. I am a novice and I am please fly suprised they cooked to perfection! If I can cook them to perfection, anyone can!!! I did modify after washing the seeds In the colendar I left them spread out on foil to air dry overnight before tossing in olive oil and it the oven. If the seeds lose their “crunchyness” can you put them back in the oven? Easy way to remove pumpkin pulp from seeds is actually to remove the seeds from the pulp. use small sharp knife to cut it out, rather than spoon. Over a colander, under running water, grasp a hunk of pulp in one hand and “milk” or strip the seeds from it with the other. keep your hands down in the colander as much as possible because the seeds are sligtly slimy and you don’t want to be popping those puppies all over your kitchen. I decided that I wanted to make pumpkin seeds this afternoon with the two small pumpkins I got at the pumpkin patch a few weeks ago. I googled how to make pumpkin seeds and found your blog. I followed your directions and ended up with some yummy pumpkin seeds. Then I thought, I should do something with the pumpkin itself, so I thought I would roast it. I noticed on this post you mention roasting it, so I decided to follow your directions for that as well. 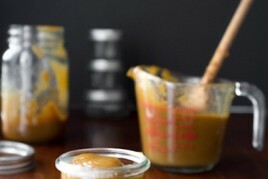 At the time I wasn’t really sure what I was going to do with my pumpkin puree, but your post on roasting the pumpkin then lead me to your pumpkin butter recipe. I was like, heck ya! I love pumpkin butter. So not only did you inspire me to make the pumpkin seeds, you inspired me to use the whole pumpkin! I feel very accomplished thanks to your blog. I just tried this recipe and I have no idea how other people got such great results. I’ve been roasting them in the oven for over 45 minutes now and they still aren’t cooked yet. They are soft and hard to chew, not crunchy at all. This is the first time I’ve ever tried boiling first and it didn’t work for me at all. 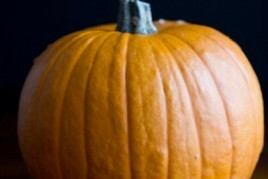 When trying to remove the stringy pumpkin from the seeds in preparation for roasting, try running warm water over them. The warm water helps break up the sticky, slimy consistency and the seeds are so simple to separate. I’m sorry if someone has already posted this trick. I didn’t have time to sift through the 300 some posts. Best recipe for roasting pumpkin seeds that I’ve ever tried. Consistently non-burned seeds. Finally! Thanks. we loved this recipe! the seeds tasted amazing. the only thing was that we had to cook them longer then said. otherwise, PERFECT! Making a batch as I type after getting nearly 2 cups of seeds from 3 baby pumpkins that I used as butternut squash and black bean chili bowls. TWO CUPS!!!! I’ve seasoned them with my most favorite seasoning ever: smoked paprika. It’s brilliant on popcorn (with butter and salt, of course)… I can imagine it is going to be divine on these pumpkin seeds! I’ve never tried the pre-boil method before. Can’t wait to see how they turn out. As far as cleaning I just dump everything into the sink. Most of the seeds float. I just scoop up those that don’t. Rinse and repeat until clean. I had a problem with this recipe though and I don’t know why. After 20 minutes at 325 my seeds were still raw. I had to keep roasting again at 10 minute intervals. It wasn’t until after an hour that the seeds became crunchy. Still this is a better and healthier way than I used to do it. I used butter instead of olive oil and they would burn easily. When I clean my pumpkin seeds I use a large bowl and a strainer fill bowl with water put strainer in bowl of water and pour seeds in the strainer. The seeds will float to the top and most of the pulp will sink to the bottom of the bowl. Just scoop the seeds out onto paper towels or dish towels and the strainer keeps the pulp from going down the drain. boiling made the difference. Thank you. I had never boiled the seeds beforehand, but thought I’d give it a try. I think it reduces the baking time (since the seeds are already hot) but otherwise did not make a noticeable difference. Stumbled upon your site and enjoy your work; thank you. Hope your cookbook—and you—are doing well! I eat pumpkin seeds year around. When I can’t get fresh seeds I buy Davids brand. They don’t taste very good straight from the bag so I put a couple of teaspoons of margarine in a frying pan and toast them. Stir them continuously so they don’t burn. When they start to pop thy’re ready to eat. Make sure to cool them for a few minutes first our you’ll burn your mouth. Cleaning the seeds: put in water and use mixer beater and it cleans them fast and doesn’t hurt the seed. I used a hand egg beater and all the flesh tangled immediately in the bottom part and off the seeds. We hand out this method at our pumpkin patch we hold at our church. If you put the seeds in a large mixing bowl after scraping out the gook, and add hot water, you can wade your hands through and remove most of the gunk. This might help you clean them off faster. I’ve heard beating the seeds in a bowl of water on an electric mixer for a while separates the seeds and stringy parts. Apparently the seeds float to the surface, string-less, after a few minutes of mixing. I haven’t tried it though. Thanks for a great recipe!! Off to try it now! I’m still going to try to cook them…. but not until tomorrow. I’m far more interested in eating than I am cooking, but one must cook to eat! Tomorrow is Friday so maybe I’ll have time to give your recipe a try. I hope they turn out! the way I separate the seeds from pulp is put them in warm water and move them in a raking motion with fingers and the pulp should fall to the bottom. I found a super easy and cheap way to clean the seeds! It takes a whole MINUTE max! You need the lid to one of those pots that has the strainer lid. Toss all of your seeds in it and run water over them with just enough water flow to make them float. Those lids don’t have as many holes as a regular strainer, so water will build up in it. All you have to do then is stick your hand in and grip the seeds over and over again. It took me less than a minute to clean a whole pumpkin’s worth of seeds! Okay, so this isn’t a way to clean pumpkin seeds, rather a way to get them out of the pumpkin ALREADY clean! I cut my pumpkins in half and carefully run my fingers through the web-pod type fleshy pulp holding the seeds that runs from top to bottom and get my fingers behind the seeds, almost cradling the seeds in my hand. I then carefully pull on the seeds, leaving the flesh behind. I then scrape out the seedless pulp that’s left! This takes some finesse and time, but way, way, WAY less time than digging through a huge pile of pulp and seeds after taking them all out together. Try it, you like it! So…….do you love me forever now??? Cleaning seeds, remove them almost clean from the pumpkin, just rub the inside of your pumpkin with long rubbing strokes of your fingers, the stringy stuff will stick to the inside and the seeds come out almost clean. Just rinse seeds after. forgot to mention, after you have rubbed the seeds out of the pumpkin, then I scrap the inside pumpkin to remove the stringy guts with a spoon. The pumpkin is cleaned, and ready to use for whatever you use pumpkins for. When cleaning the seeds I have found that it is pretty easy when using sugar pumpkins that you are preparing for pumpkin pie. First, quarter the pumpkin and then take a spoon (metal teaspoon) and using the edge of the spoon pushing into the guts of a piece of quartered pumpkin. The seeds will pop free of the strings by repeatedly pushing the edge of the spoon into the guts/string of each quartered section. You will need a bowl or something else for the seeds to fall into and many of them will shoot off in different directions, but really easy to clean up. 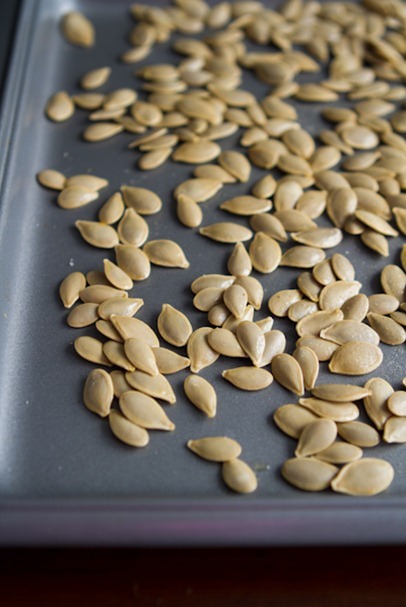 To clean pumpkin seeds: after scooping them from the pumpkin, liberate them from the foamy thick membrane. Don’t worry about how much stuff is clinging to them. Put them in a fine mesh strainer and under the faucet swirl your finger around seeds several times. You’ll noticed a lot of the goo and stringy stuff coming off. Dump the seeds into a bowl and tap out the strainer, pick out the big pieces that have now loosened from the seeds. Repeat several times and rinse the strainer upside down to liberate the tinny cling on’s. A few rinses later your seeds are clean as can be. Just a couple of suggestions. To help remove the slime from the seeds, put a tablespoon or two of vinegar in your water and let them soak a few minutes. You can use lemon juice too. Neither of these will change the taste of the seeds and both help to reduce the slime from the pumpkin. Second, after boiling I put a paper towel inside the bowl of my salad spinner and put the seeds on the towel. A quick spin and most of the water comes off. A few seeds may land in the outer bowl, but those inside the spinner are much drier and ready for the oven. YUMM! I FOUND THE EASIEST WAY TO DE-SEED A PUMPKIN!!! My pumpkins got almost completely FROZEN from being outside and even though its a little tough to cut into it initially, the strings are frozen together and the seeds pop right out with little guts on them!! Angela, I’m working on getting the pumpkin seeds ready for roasting per your instructions. I tried something for cleaning off the pulp that seems to work pretty well. I put a handful in a bowl of water and mushed the seeds around with my fingers. Most of the pulp came away and sank or at least came off the seeds. I hope this helps you next time. You have omitted a critical step. You have to dry the seeds, rub them and winnow them to get the cellophane-like layer off the outside, otherwise the salt does not penetrate the seed. After this, you salt them, dry them and roast them. I do 300 for 14 minutes with a toss half way through. I have made and sold hundreds of pounds of pumpkin seeds and the carving pumpkins are better. We grew 10 acres and you always had some with bad spots and we’d go through the field with 5 gallon buckets, a knife and a spoon. After we were done, the farmer next door got to run his small herd of cattle in, fertilized for next year. –Start by using a spoon to separate the seeds from all the pulp around them. –Place seeds in a coarse colander (big enough holes for the pulp to go through but not the seeds), and put that in a bowl of warm water, so the seeds are covered with water. –Wearing a pair of exfoliant gloves, the knitted-with-abrasive-fibre kind that are sold for rubbing off your dead skin when you shower, rub handfuls of seeds between the gloves, letting them fall back into the water, and repeat for a few minutes, until the seeds are free of pulp. –Lift the colander out of the bowl of water and rinse the seeds. Empty the bowl. Repeat the process if there’s still pulp on the seeds. And voila, clean pumpkin seeds in a relatively short time. Wash and dry the gloves and save them for next time. –I then soak the seeds overnight, let them dry on a mesh sheet (this “swells” them rather than sprouting them, but achieves a similar tenderising effect to boiling, without killing off all the enzymes in hot water). Then I marinate them a few hours in a combination of toasted sesame oil, sea salt, and either tamari or lime/honey marinade. If I want to keep the “raw” benefits, I then dehydrate the seeds til they’re crispy. But if I can’t wait that long, roasting them as recommended above works great too. Yummm! My new favourite snack! This note is for cleaning pumpkin seeds. I like pumpkin pies and pumpkin/apple bread. I have been trying to make them (with little success) from home grown pumpkins. I good thing that came out of it was roasted pumpkin seeds. I grow miniature pumpkins at home so this may not work for world class pumpkins. I can boil the pumpkins in a crock pot for a few hours to soften them. This takes off the outer membrane (so the pumpkin can be spooned out for the pie or bread) and loosens the guts from the seeds. Sometimes I just scoop out the raw guts from the pumpkin and simmer it on low in slightly salty water. This does the same thing. Then I wash the resulting seeds and the guts just peel away. Some seeds can’t be separated, so I just throw them away. This method doesn’t completely clean the seed, it still has a pumpkin taste to them, but they are pumpkins after all. I just burned my first attempt at pumpkin seeds, so I googled recipes and was glad to have a chance to revisit your blog. 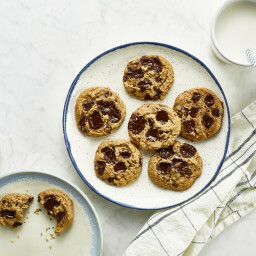 (I love you chewy trail mix cookies.) I bought raw pumpkin seeds from the natural grocery store and tossed them in coconut oil, a little salt and cinnamon, 1 tsp cacao, and 1 T coconut sugar. But I baked them on 375 and didn’t know about the inner seed (great tip.) I’m still eating them burnt but will definitely try again on a lower temp. And for a savory variety, love the herbmare idea. Pumpkin seeds are quite easy to clean. I just did quite a few and the strings came off quite easily. air them for a day or so. The strings come right off the seeds then. To get the guts off, I rinsed them in water under the sink. Ran the water at over the seeds so it circulated them. The guts came right off! The best way to remove the seeds: Use a plastic food processor blade, and fill the processor bowl with pumpkin innards and hot water. Run for a minute, then pour contents into colander. The food processor really helps to separate the seeds from the strings. Instead of boiling in salt water, I put the seeds into a small pressure cooker with the salt and water. My family likes a little more salt. Pressure for about five-seven minutes. It puts the salt inside the shell. Drain. Bake as usual. When the boys were kids, we raised pumpkins just for the seeds. The pressure cooker works well for homegrown sunflower seeds, too. Don’t worry about pulling all the threads from the seeds. Just remove the major pieces and put the seeds (threads attached) into the water to simmer. Spread the seeds onto the paper towel and cover with more paper towel for 5 minutes. When you remove the paper towel from the top the threads will also come off with the towel. Any remaining will stick to the bottom sheets of paper towel as you pick up the seeds. Just wanted to say thanks for the recipe! Cooked them today for a previously pumpkin seed pessimist boyfriend that just ate the lot! Hi all, this sounds yum but a lot of trouble to go to. I always pull the seeds out. Remove most of the pulp but am not fussed with some being left on them. Lay them out on a paper towel sprinkle salt over them. Sometimes I also put paprika. Put paper towel over top & let sit for 3 days. They naturally dry out & the shell naturally goes crunchy. Absolutely yummo. Fast, Easy & everyone loves them. This recipe works with acorn squash seeds as well. Just pop them out of the oven about five minutes shy of the full 20 minutes. Delicious! I thought I would try your technique for roasting squash seeds as I had seeds from three squashes from making squash soup. It seemed so laborious picking off all the little bits of squash stuck to the seeds and I nearly changed my mind. I rinsed as much off it off as I could but there was still a lot left. When I read that you have to boil them for ten minutes I thought…..why don’t I boil them before trying to remove the bits stuck to the seeds and maybe the cooked squash would come off easier. So that’s what I did. A lot of the squash just fell off into the water. I started lifting out the seeds with a hand strainer(big holed) to see if they were clean and returning them to the pot after. Each time I scooped the seeds out bits of squash remained in the strainer. I filled a large bowl with water to rinse the particles off the strainer each time I scooped. It sounds tedious but it didn’t take more than ten minutes and I had the seeds of three squashes which is a lot. When the seeds seemed reasonably clean I removed them onto parchment paper. When cool I massaged the remainder of the squash off the seeds by massaging with paper towels. I wouldn’t say they was 100 clean, there were still a few bits here and there but I think this process was a lot less work than pulling the squash bits off each individual seed. Thought you might want to give this a try or even adapt the method. My seeds are toasting in the oven and can’t wait to try them. Thank you so much for this great recipe! !!! Worked a treat! !!!! I used organic Hokaido Pumpkin seeds grown here in Sintra, Portugal. The 1st time I cleaned them (painstakingly). The 2nd time I just boiled them with all the bits which then washed off easily. Now I’m about to eat my pumpking and lentil curry. I use blue pumpkins(we use them for the best pumpkin pies) love the seeds out of them. I think they are better then the pie or craving pumpkins!!! :) however the pumpkin it’s self to cut up is more difficult but it’s not stringy or real gooey inside. I just made these (after roasting some sugar pumpkins I bought following your directions!). They are yummy! I’m now digging into your vegan pumpking mac’n’cheeze recipe for lunch. Thanks for sharing them! omg i abso lute luv thw pumkinz ther so freakin good omg i like to lick them when they come out of the oven cuz their hot like my boyfran. i add extra salt on min cuz i like to pretend im at the ocean in the fall tim. omg try it!!11!!! I used this recipe with Dumpling Squash seeds! I shortened the time a little bit and it worked just as well! Thanks (: I’ve only tried pumpkin seeds one other time, and I burnt them! And I had a hangover from a Halloween Party that day, and boy let me tell you, the smell of them was horrible to my hungover head. I use my salad spinner to clean seeds. It works like a charm! Hi Angela. I really appreciate your method; the boiling never occurred to me. So, in answer to your question about cleaning, this is what I did… I just spooned out the seeds into a bowl, pulled the excess pulp off and let the rest of the small, sticky pulp come off in the boil. It worked perfectly. After I strained the water, I made sure there was no pulp left on the seeds when I dabbed with the paper towel. There was some tiny stuff left on that the towel got off, but almost everything came off in the boil! I even strained the boiled water into another bowl when I was done, added chai tea and pumpkin spice,and made a pumpkin chai tea out of the water… Hope this helps. You can also roast other squash seeds like acorn and butternut. Use the same method as describe in this post. I just finished roasting acorn squash seeds and they are delicious. Anyone got a tummy ache by under cooking them? I made these and they came out PERFECT! Thank you for these instructions! I used kosher salt and Old Bay to flavor mine, very tasty! Last fall after my family and I got pumpkins, I decided I didn’t want to let all the seeds go to waste, and that I would try making pumpkin seeds a go. This recipe is awesome! Pumpkin seeds are now my favorite fall snack, and I’m so glad I stumbled upon this website. All summer I have been dying to get pumpkins again, and I guarantee that I will never throw the seeds out again! I highly recommend this recipe. Although the seeds take a while to prepare, trust me, it’s definitely worth it! I believe I may have just found a fast way to clean pumkin seeds!! As you’re cleaning the pumkin, try to get the majority of the seeds along with some of the guts and put them in a large bowl. Fill the bowl with water. As you’re doing so, squish the seeds in your hands so they squeeze out through your fingers. Keep stirring and mixing the seeds up until the bowl is about full. Let the seeds settle and you will notice the majority them float and the guts sink. I scoop the seeds out of the bowl with my hands because any slime slips right off. My seeds were so clean after this process, I didn’t even need to rinse my seeds before boiling them! Hope this helps. The seeds are in ridges along the pumpkin wall. I learned this when I halved a pumpkin to make a pie. If you reach down into the seed ridges, you pull basically seeds only, minimal guts. So pull the seeds first and the then clean out the guts. Happy Thanksgiving. You asked if there was a more simple way to take the pumpkin strands away. I can’t tell you it’s a whole lot easier, but if you separate the seeds from the main part manually beforehand, you can soak them in a large bowl of water, swish around, and scoop them up in your hands. The strands drop to the bottom of the bowl, and the floating seed is easier to clean. I tried using coconut oil. You can’t roast them in very high temps or it will smoke, but the added flavor is wonderful! Child labour! If you have access to one or more they love separating gunk from seeds! the easiest way to clean a pumpkin for seeds is to gently bounce it on the floor or table ,only raise about 3″ high and bounce in all directions.Now cut the top off and dump the seeds out. Excellent! I have always botched pumpkin seeds. This is the best recipe! These turned out wonderfully! So good! Perfectly crunchy. Will be making more as soon as I get my hands on another pumpkin! I found using a fresh pumpkin makes for easy cleaning of the seeds. The longer the pumpkin has sat around the more the seeds ‘cling’ to the ‘guts’. Do you eat the shells? 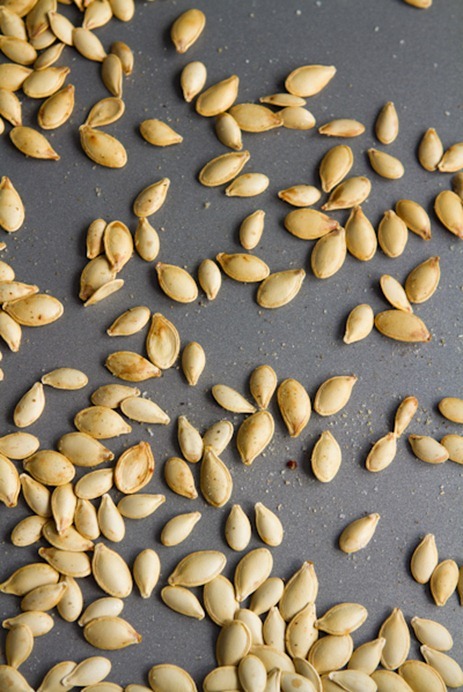 How long can you save the seeds before roasting? How do u preserve them until you are ready to roast them? Today I boiled the seeds with the pesky hardest-to-remove guts still on them, and they were MUCH easier to remove than last week, when I tried to remove before boiling. (You are right, Girlytoes!) Today the guts practically removed themselves. Love your site, Angela. Thank you. I just carved two huge pumpkins with my sweetie and baked up two batches of these, boiled and all. I did the first one with olive oil, salt, and pepper and it smells like french fries and the second batch is olive oil, cinnamon (lots of cinnamon) and brown sugar. My whole house smells like happiness! Hi there! Just wanted to say thank you for this easy-peasy recipe! My mom used to roast pumpkin seeds from our carved pumpkins every year when I was little, and I have been wanting to do the same for my kids for a long time. This year I finally went for it and googled a recipe. Yours popped up first and I’m so glad it did! They taste perfect and remind me so much of my mom’s. Happy Halloween and thank you again! If you don’t have any olive oil on hand, could you use vegetable oil? Or what would be another usable substitute? Absolutely the best Pumpkin Seed Recipe I’ve come across. Look no further, this one is simple, quick and very addictive! And you don’t have to “waste” a pumpkin if you want seeds. I love to make squash soup, and I always roast the butternut squash seeds. They are very tender and crispy, and make a fun garnish for the top of the soup. The best pumpkin seeds I have ever had. I love how easy it was to follow your instructions. Thank you. I have always wanted to make roasted pumpkin seeds, but frankly I was scared. They turn out great, thanks to you. As I was separating the seeds from the pulp last night I was wondering why I was even bothering, as I haven’t had good results in the past and the seeds would sit around until I finally put them in the compost! This method worked great for me and now I can’t stop eating them! By the way I love your site and recipes and was so pleased when yours was the first to pop up in my google search for pumpkin seeds! Following the recipe to a T. Going on 25 minutes in the oven and still not crisp. Tested at 15 minutes and nowhere close to being done on the inside either. Oven is set at 325 degrees but our oven tends to run hot. Which is why we have an oven thermometer in the oven. It says 350 degrees. I use butter instead of olive oil, sea salt, and sprinkle some adobo sinpimienta on them (it’s a sort of garlic mexican allspice). They turn out incredible. Have tried making these before and met with failure. Thought I’d try again and when I saw this in the google search, knew I had to try. Glad I did! Thanks for posting because this batch turned out amazing. I have some seeds in the fridge that I plan on roasting and will be trying the boiling method as it sounds like a good iresulting in what I’m looking for – crunchier shells and saltier seeds. I do agree, though, that the pumpkin gunk on the shells add an extra delicate element of crunchy flavor to the seeds. So hmmm … I will probably leave some guts on the seeds and gently simmer them in the salty brine. Now, I love the seeds plain with salt, but another flavor I have used is that like from the Chex Mix recipe. The seasoned salt, the worcestershire flavor and the taste of browned butter all on the outside of a tasty, toasty pumpkin seed! I’ll bet that combination with the addition of rosemary would be super good! oh man, i can easily eat a whole batch in a day! I just made these with a bit of hesitation, since I’ve never heard of boiling them until now. They are SO delicious!! But all the big, carving pumpkins were sold out so I ended up with 2 small, pie pumpkins. The only difference; they take about 8 minutes more in the oven than the recipe calls for. new to pumpkin seeds and this recipe yielded an unexpected yummy snack. thank you for posting this. i used a toaster oven at 320F for 18 minutes. i also forgot to pat dry before adding olive oil and salt, but recovered with a dry pat after the olive oil, and adding a wee bit more salt. (it looked like it had enough oil.) thanks again! Tried this recipe after purchasing a bag of raw pumpkin seeds. I can see that boiling is the secret plus seasoning my batch with popcorn salt. Thanks for the recipe! It worked out great. I divided the pan when I seasoned the seeds: 1/4 sea salt, 1/4 salt & garlic powder and 1/2 Old Bay seasoning. Guess which one I hoped what the best? (It was)! I just wanted to mention for your pumpkin seeds a great topping with some kick to it, is sprinkling on some Clubhouse spices in Chipotle, so delicious, i also use this on kale chips, gives you awesome taste and if you like a bit of heat with your chips. Try soaking in vinegar! Salt and vinegar seeds! Yummy!!! I just made these. I’ve never done them before and I must say it was very easy to do and the seeds are delicious. I will definately do them again. How do you store them so they stay crunchy? They turned out super crunchy from the oven. I let them cool completely, and then put them into a plastic container but they were soft and chewy the next day. 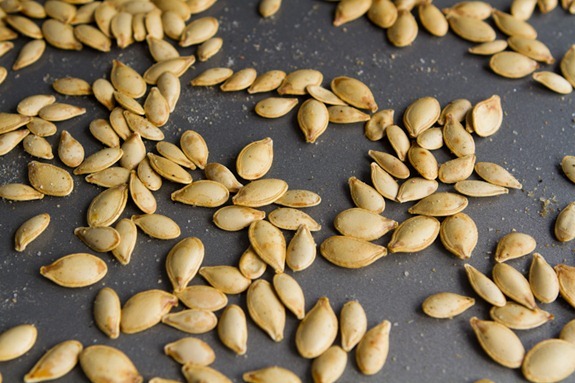 I’ve never been able to get roasted pumpkin seeds to work…these worked and are soooo good. I agree they taste like popcorn! Just eat the pumpkin from the outside like a big apple. Delicious! Oh dear Lord, you are my hero. I’ve been sitting here for about 15 minutes looking up various ways to toast/roast pumpkin seeds and I’ve seen everything from “cook for ten minutes” to “cook for 45 minutes.” I don’t even want to know what those 45 minute ones will look like. But then as I’m continuing in my Google search I see, “The first time I toasted pumpkin seeds I burnt the crap out of them.” FINALLY, someone who speaks my language! Oh my, you had me laughing from the get-go. You are now a permanent bookmark, go-to, “what’s for dinner?” landmark in my computer. Thank you, thank you for making my day and keeping it real! All squash seeds are good roasted – today I have acorn squash seeds. And cumin, garlic powder and cayenne. Yum. Made these tonight and they turned out great. Whenever I roasted pumpkin seeds before I always burned them. Thank you! I never knew about boiling them first. Delicious. It took another 10 minutes; total 20 to cook. Tried sprinkling garlic powder on some, cayenne pepper on another section and sea salt on the rest. Each has a unique and great aftertaste. Thank you for the clear directions. I used this on pumpkin seeds last fall (fabulous results) but have been using it on my butternut squash seeds after making soup and it’s every bit as tasty — love it! Hey how about cleaning the seeds, boiling in water to clean off, then adding back a LITTLE of the pumpkin gook for flavor? am I overthinking this? but i do like the flavor the gunk provides but then they take a long to bake AND they run risk of overcooking…. i’ve used soy sauce with some sciracha and they were quite good..
Just don’t clean or boil them. Remove chunks and strings off seeds but leave gook on for flavour. I add a little salt and nothing else. Let then dry out good on a tray for a day a couple of days, stirring occasionally to keep then from sticking to the tray and each other. Then slow roast at 250 for a couple of hours. Finish at a higher heat for a few minutes if you like them a bit browner. I wasn’t definitely in the category of burnt them the first time around. I hope I have better luck next time! just used this recipe and it was perfect!!! the tip about boiling the seeds before putting them in the oven was great….they may or may not have been eaten in one sitting…….. thanks!!! Hope you enjoyed them, Tori. and had a Happy Halloween! Here is what i am doing with pumpkin and squash seeds for a long time. Once the seeds are roasted and cooled, I grind it to a powder form. This PPS (pumpkin powdered seeds) are transferred into a glass jar and in one of the small glass containers that is typically used for spices. I use PPS, and you may wish to use it, as an additive into many cooked and cold meals, serials, drinks, smoothies, yogurts, kefirs, over the bread spreads, all at your choice. Just shake the container (something like a salt shaker) and insert or spray the PPS over the meals/drinks as desirable. I also combine the PPS with other plants and fruits powders in one container. One of my favorite, which few other people also like it, is a mixture of PPS and roasted powdered hemp seeds with 2% of spearmint powder or with 2% of xylitol natural sweetener. For those of you who did not know, Xylitol actually kills bacteria in mouth and its degree of sweetness is equal to that of regular sugar. I want to thank you for helping me make truly addictive seeds!!! I just took them out of the oven and I can’t stop eating them!!! I did, however, do something a little different from your recipe. I let them dry out completely over night. They are so crispy and delicious. They also didn’t take very long to roast. I’m so glad I bought 6 pie pumpkins!! There will be so many to go around!! So glad you found this helpful, Robin. Enjoy those pumpkin seeds! Jean, I just saw your note in passing and thought I would comment even though its been a year since you raised the question. There are multiple species in the pumpkin/squash family, and many selected varieties in each. Seeds vary by species from thin-shelled like pictured in this post, to some that are very blocky and thick-shelled. On the latter, I shell each seed as I’m eating them, like I do sunflower seeds. On the former, I find the shell tolerable to eat. Maybe you have had one of the ones with the woody, thick-shelled seeds? My personal favorite are the “naked-seeded” varieties, which I have grown in my garden. They grow no hull on the seed at all! But the trade-off is that the flesh of the pumpkin is very bland. In the process of roasting seeds – going to give it another try. To clean, I threw the seeds into a ziplock bag with a bit of water, sealed it up and rubbed the baggie on the counter top. The pulp cane off very quickly. Added a little more water to the bag to get some space between pulp and seeds, and voila less than 2 minutes and i’m Scooping the floating seeds from the baggie! Clean and easy! These were brilliant, I also added a bit of sugar to the final product to add a bit of a sweeter vibe and this is great because it means I don’t have to throw away the seeds! NOOOOOOOO don’t take away the flavor! My seeds go out of pumpkin, out of guts, on to oiled cookie pan, salt cayenne pepper, into oven. Pumpkin “slime”? I love it, the seeds taste so much better. All the cleaning in really unnecessary, the seeds do not need it, nor do they need drying, or any other treatment. Really it is just that easy. 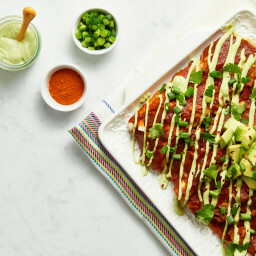 I’ve since tried them this way and I have to say this method is delicious! I’ll have to update my post. I used this recipe to add a roasted pumpkin seed roof to my gingerbread house. They made perfect shingles for the roof. I’ve been using this recipe for several years now, since I found it on Google. Whenever I follow it right (I’ve been accidentally using waaaaay too much olive oil; a little goes a lot farther than I think! ), it makes absolutely fantastic pumpkin scenes! Last year, I made garlic powder with cayenne pepper and *loved* it, but had several requests for the standard salt. My favorite part of pumpkin carving is pulling out the guts and roasting the seeds, so this year I plan to make several batches with all sorts of yummy things on them. Thanks so much for the recipe! !